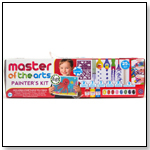 Take a closer look at ASTRA's Best Toys For Kids Nominees in the Pretend - Fantasy Play category. Fairy Town Train Set: The land of railways and trains just got even more exciting. 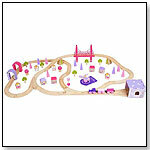 Enter a magical world of colorful cottages, bridges and trees, designed in a gorgeous princess themed purple and pink. This bright and cheerful wooden train set contains 75 pieces. An ideal first train set, it contains a chunky engine and three detailed royal carriages, which attach using a magnetic system – perfect for little hands to use. Can be used with any wooden railway system. "Compatible with existing wooden rail systems. The Fairy Town Train Set is among the few available train sets specifically designed for girls," Liza Grando, President of The Moss Tucker Group, told TDmonthly. Launch date: February 2012. Henry Haba-Strong's Armor by HABA USA/HABERMAASS CORP.
Small knights can easily put this armor on thanks to the hook and loop fasteners. The armor comes with an extra chest protector showing a fiery dragon and an adjustable belt. Material: cotton/polyester. 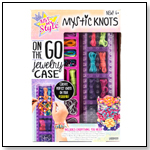 Dimensions: for children age 3 to 6. E-Rangers Headquarters by PLAYMOBIL INC.
With a detachable roof and changeable transparencies in the command canter. The balance Racer can be turned into a propeller or a jet-car racer. Launch date: August 2012.